A pan of warm hot cross buns. Yesterday a friend posted a link to a rant about how holidays and celebrations have started to go way over the top, and with it the expectations as to how they are to be celebrated. And I totally agree. them back in and continue on. The gist of the “rant” (in the most positive meaning of the word) was that this mother’s kids were expecting the results of a visit from a leprechaun for the morning of St. Patrick’s Day. Of course(? ), the expectation from the children was for bags of “gold” (candies) to be stashed around the house, and/or obligatory St. Patrick’s Day parties. Huh? What has happened to us? Why is it that we feel the need to over-celebrate – or is it over do – every tiny holiday that pops up on the calendar? If you think I’m exaggerating, take a look on Pinterest for a truly guilt-laden experience. The link is here. I particularly like the green pee in the toilet and leprechaun footprints on the toilet seat. Go look. As a parent did you do the utmost for your children to celebrate this “siginifcant” holiday? Really? Come on... really? When I was young (insert blah, blah, blah here) all we did was wear something green, even if you weren’t Irish. Or if you were a Catholic or Anglican, probably a church service. I have never had a green beer in my life. That’s a good way to ruin it, no? This got me thinking about the next big holiday, and I don’t mean the Vernal Equinox on March 21, although I imagine there are parents and groups out there plotting how to send that day over the top as I write. I’m talking about Easter. You know, the one where most of us actually have a day off work. I have read that we are raising a generation that has little empathy for others. The “Me” Generation. It’s due to a lot of factors, but to me prime among them are the lack of consequences to failure and the fulfilling of every need/desire of our little “tyrants.” Because, face it, that’s what many of them have become. It’s far easier in our busy days to just throw something at them to make the problem go away. The Art of Parenting has significantly diminished. In essence, the inmates have taken over the asylum. I’m not here to denigrate how anyone celebrates holidays, but you do have to give your head a shake if you think that every minor celebration has to be turned into some sort of life-altering event. It’s too stressful, expensive and completely unnecessary. It’s pure, naked commercialism, folks. “They” want you to feel guilty if you don’t buy buy buy. If you don’t do significant damage to your bank account your heart is empty toward those you purport to love. Can you remember anything – anything – you ever got for Easter? I thought not. So what does make celebrations memorable? Lets get back to the basics. I bet you can remember who attended your last Easter dinner and how you felt. One way to treat the holidays is to carry on real traditions, not ones manufactured by marketing gurus. By “real,” I mean ones you really will remember, ones your parents remember and probably even your grandparents. Consumerism wasn’t quite so rampant back then. We made do, often on very little. But we didn’t think we lacked anything. 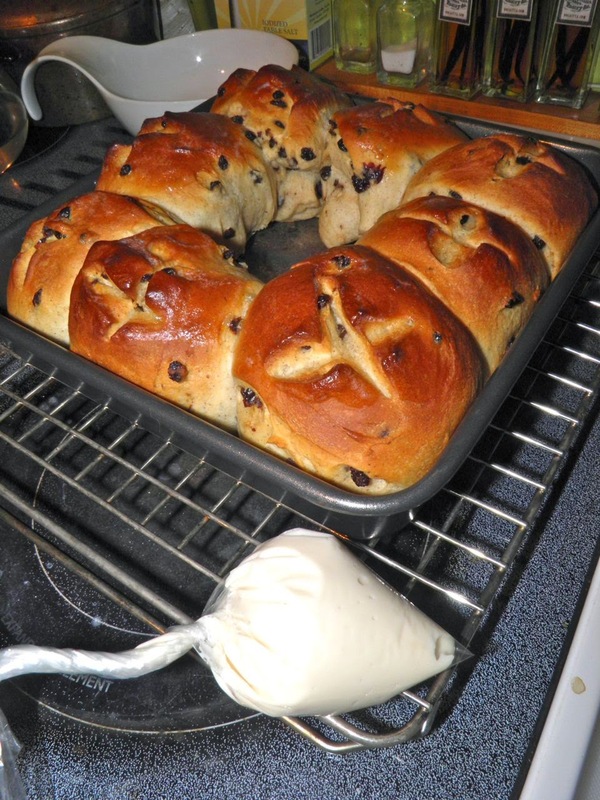 Hot cross buns are never served as a dinner roll but as a “dessert,” due to the sweet egg dough, currants and (if you’re doing them right) copious amount of icing. The amount of currants and spice can be adjusted to your own liking. I find “store-bought” very frugal on both ingredients. Hot cross buns are traditionally eaten on Good Friday, with the cross standing as a symbol of the Crucifixion. 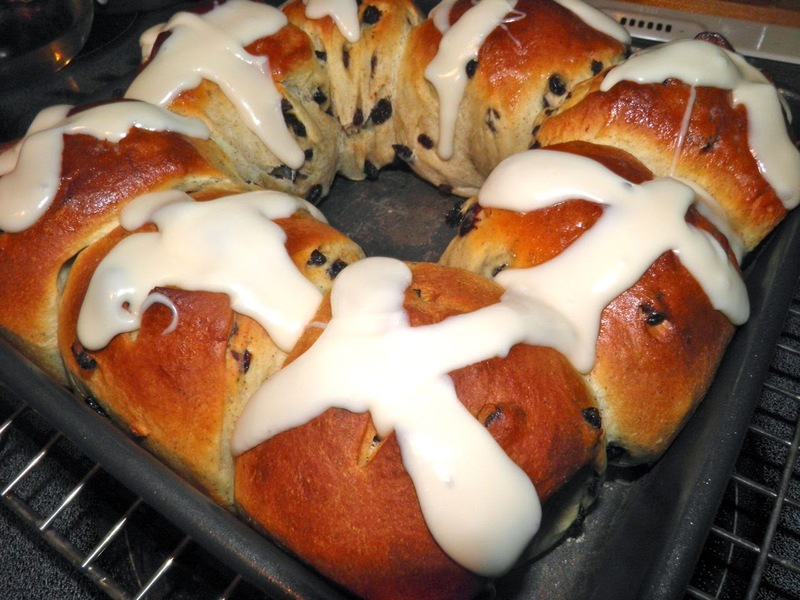 They are believed to pre-date Christianity, although the first recorded use of the term "hot cross bun" was in 1733. 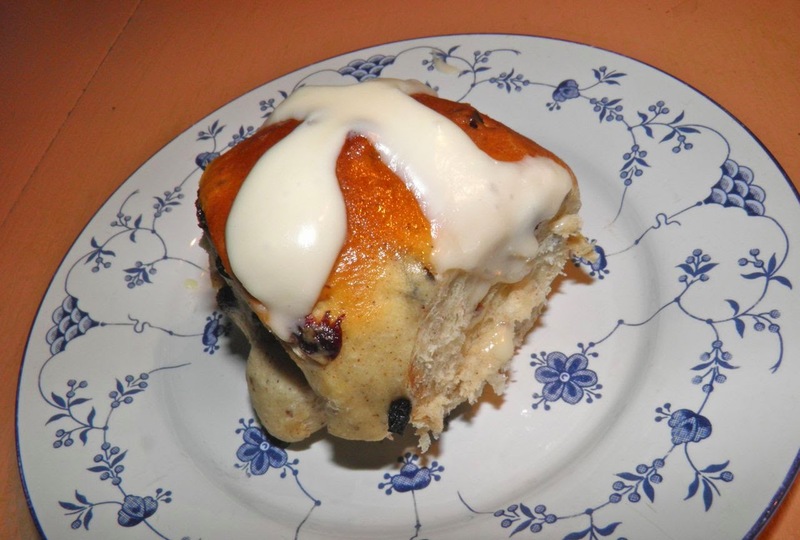 So, if you’re like me, and are “mad as hell and not going to take this any more,” perhaps step back a bit, refocus life, and enjoy a sweet bun, loaded with icing. But wait a while. Easter isn't for another month. 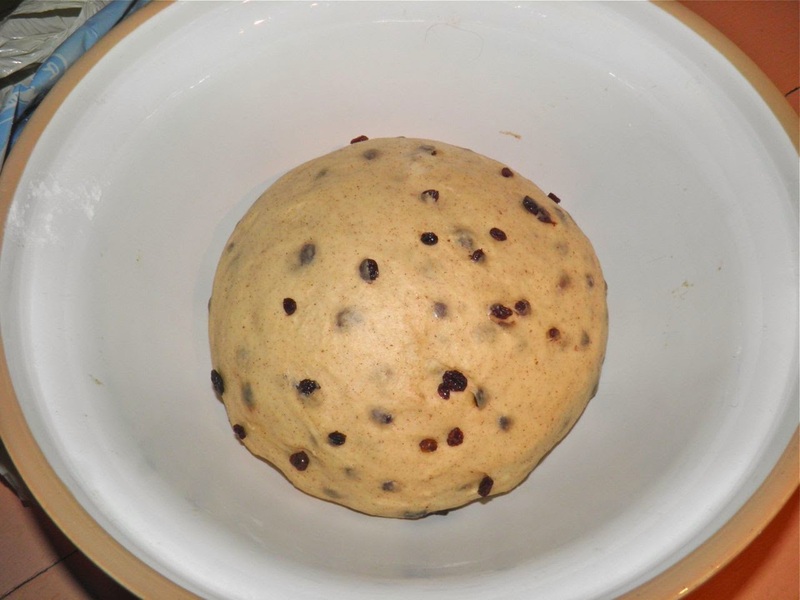 Sprinkle the yeast over the top of the liquid. 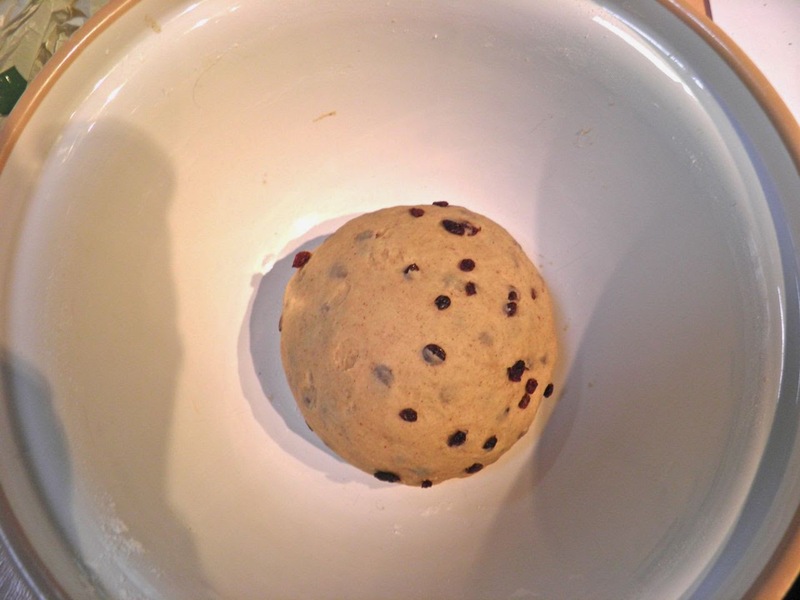 Stir gently, cover and let sit for between 10-15 minutes to “proof.” At the end of the time the yeast should be creamy. If not, start again with fresh yeast. At the end of the rise, punch down and divide into 8-12 equal balls. 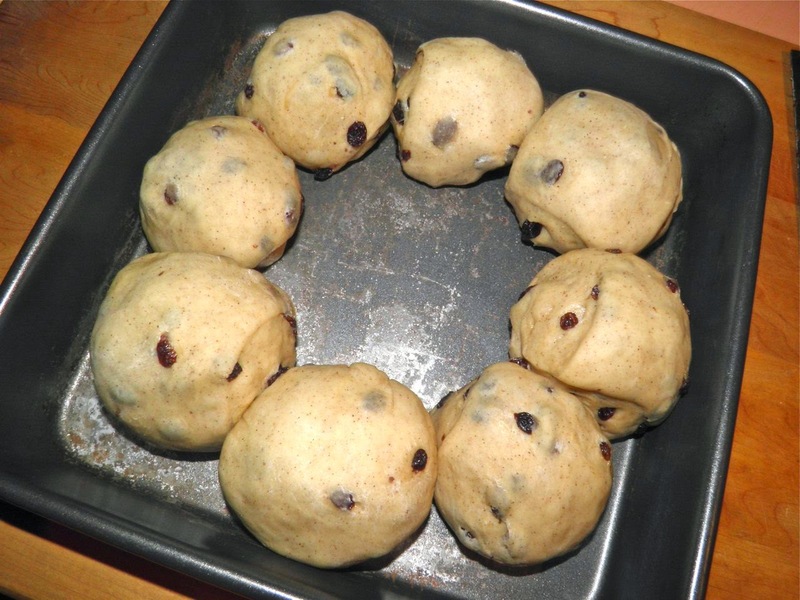 8 balls make good sized buns, 12 make the number of apostles… Arrange the balls in an 8” x 8” oven-proof dish. Let rise again until doubled, about 30 minutes. Mmmmm ... looks great. And I totally agree about the over-commercialization of every holiday that is supposed to have some spiritual and/or social significance. We've turned thousands of years of culture into a shopping spree. Thanks for the entry. Enjoyed it.